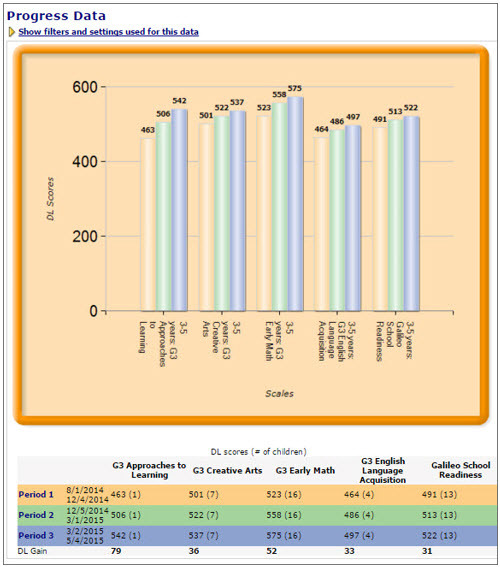 The Galileo Pre-K Online Developmental Level (DL) Score is a summarized measure of ability. The DL Score indicates a child’s position on his or her path of developmental progress. When generated for a group of children, it will reveal the group’s average position on the path of development. The path is comprised of a series of empirically ordered capabilities outlining a developmental progression for each scale or developmental area. When we know the ability of a child or a group, as summarized by the DL score, we know the capabilities that have been learned and the goals that a child or group is likely ready to learn next and in the future. 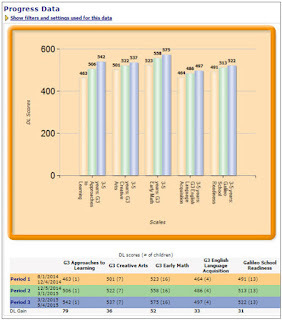 The DL Score is a valuable data point for planning and monitoring progress towards school readiness. After the teacher contributes his or her knowledge of a child’s ability by saving observations, the DL Score provides specific information on emerging capabilities by identifying “Ready Now” or “Plan Now” goals. These readiness suggestions provide the basis for planning appropriately challenging instruction. The DL Score can communicate progress to educators at home and in the classroom, identify an intervention opportunity, and inform which skills are ready to be learned for all children at all levels. Visit ATI Exhibit #527 at the National Head Start Association Conference in Chicago April 7-10 or schedule an online Galileo Overview for more information. Get a first-hand look at Dynamic Curriculum Strategies, a curriculum solution created by Crane Elementary School District (CESD) and offered through the Galileo® Digital Curriculum Platform from Assessment Technology Incorporated (ATI). Attend this statewide seminar illustrating how the cutting edge, evidence-based curriculum that is completely aligned to Arizona State Standards can be easily implemented by all Arizona school districts/charters. Dynamic Curriculum Strategies offers a standards-based curriculum for grades K-8, affiliated resources, aligned assessments, and reporting all-in-one cost effective approach. This learning system offers a logical approach to assessment and interactive instruction with opportunities to personalize learning supporting students with a spectrum of needs. The curriculum is provided through the Galileo Digital Curriculum Platform where it is integrated with the Galileo assessment and reporting components. The intuitive Platform makes it easy to merge curriculum content with formative/benchmark assessments and reporting. The Platform also empowers educators to deliver evidence-based differentiated instruction and quickly evaluate the impact of curriculum and instruction on student mastery of standards. Plus, teachers can access on-demand instruction and assessment resources from ATI, EngageNY, KHAN ACADEMY®, and LearnZillion and easily link them to Dynamic Curriculum Strategies offerings. Together CESD and ATI are pioneering the next generation of educational innovations through delivery of the best in curriculum, educational practice, online technology, assessment, and research. We invite you to come see for yourself by hearing from local leaders and participating in a curriculum strategies breakout session. You won’t want to miss this breakthrough event. Cost: The seminar is complimentary. Parking: A complimentary parking garage is located on the east side of the building. Please do not park in the visitor, reserved, or student spaces. The ATI Status page can be accessed directly at http://status.ati-online.com. Additionally, links to the page can be found in three convenient locations: 1. the “Technical Support Request” form on the ATI website, 2. the “Contact Us” form on the ATI website, and 3. the application login pages. ATI Status Page a communication page available to all clients. The Galileo Pre-K Outcomes Analysis Report supports assessing children using multiple criteria and can now be generated for custom client-created assessment scales. The Outcomes Analysis Report is a powerful report enabling programs to analyze progressive data for one or several assessment scales over multiple time periods in one report. The report may include aggregated or disaggregated data for an entire program, center, class, or at the individual child level. The report allows users to select multiple scales, more than three time periods, and include selected centers or classes in a single report. For more information on Galileo reports, schedule an overview or join us April 7-10 in Chicago where ATI will be exhibiting at the NHSA Head Start Conference and Expo. Deborah Kinzer, one of our friendly and knowledgeable Field Services coordinators, will be available at ATI Exhibit #527 for demonstrations of the system. The Outcomes Analysis Report may be used to view children’s learning gains in one or more developmental domains across multiple time periods.